In 2014, the main Singapore newspaper reported that public hospitals were facing a ‘severe bed crunch’ and putting patients in ‘beds along corridors, with just curtains to give them privacy’ when demand spikes.1 2 Some citizens have voiced concerns about the number of hospital beds3. In this post, you will see how the number of hospital beds has increased, while the number of hospital beds per 1,000 people has decreased, over the years. 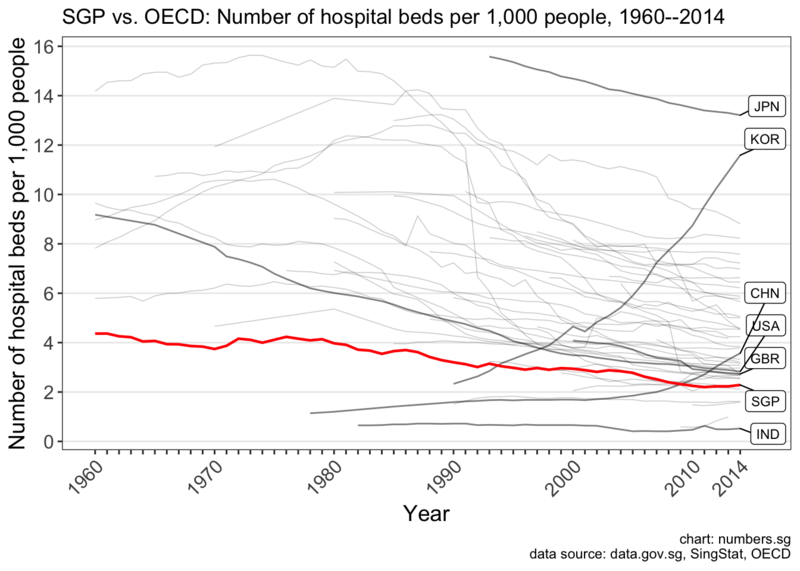 4 The downward trend in the number of hospital beds per 1,000 people in Singapore is consistent with most OECD countries. Some possible reasons for this trend are given at the end. 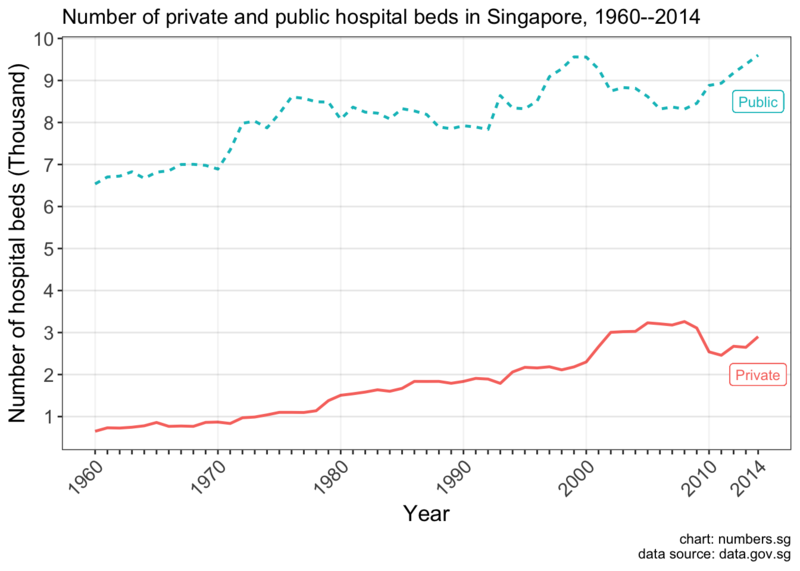 The total number of hospital beds in Singapore increased from 7,187 in 1960 to 12,505 in 2014, which is a 74% change. The chart below shows the number of private and public hospital beds for each year from 1960 to 20145. Public hospital beds increased from 6,537 in 1960 to 9,602 in 2014, which is an increase of 47%. Private hospital beds increased from 650 in 1960 to 2,903 in 2014, which is an increase of 347%. Singapore’s total population has changed over the years (see previous blog post by clicking here). We can take this into consideration by calculating how many hospital beds there are, on average, for every 1,000 people in Singapore. The chart below shows the number of private and public hospital beds per 1,000 people from 1960 to 2014. The number of public hospital beds per 1,000 people declined from 4 in 1960 to 1.8 in 2014. There is a slight increase in the number of private hospital beds per 1,000 people from 0.4 in 1960 to 0.5 in 2014. The chart below shows how Singapore (SGP) compares with 43 OECD member and key partner countries6. To make the chart easier to read, only a few countries are labelled and emphasised7. There is a downward trend in almost all countries, with some notable exceptions like Korea (KOR) and China (CHN). In 2014, the median number of hospital beds per 1,000 people in the OECD countries was 3.8. 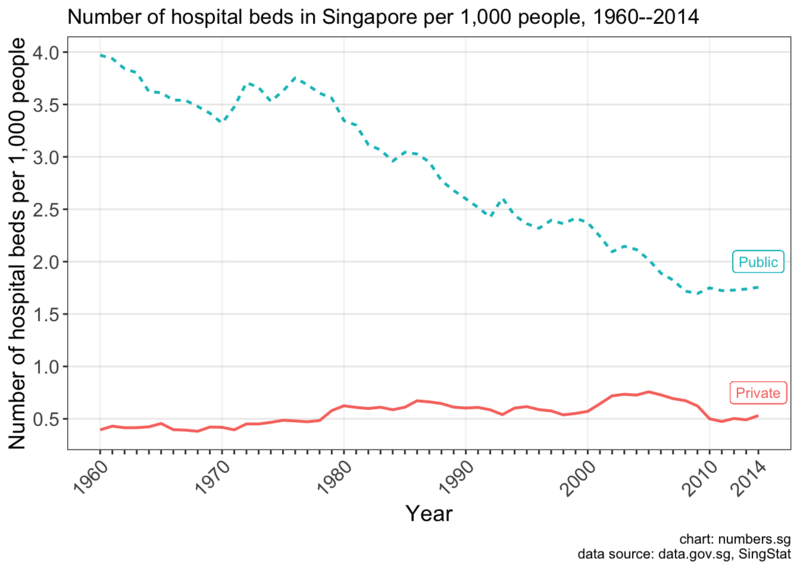 In 2014, Singapore had 2.3 hospital beds per 1,000 people. There are many possible reasons for a decreasing number of hospital beds per 1,000 people. This includes having a population that is increasing faster than the number of hospital beds being installed, as well as better medical technology and more services at the community level, both of which reduce the need for hospitalisation8.